While in Current RMS, your gear might be separated neatly by opportunity; after a busy week you might find yourself in a warehouse full of kit from different jobs that all needs checking back in! Global Check-in can help here. 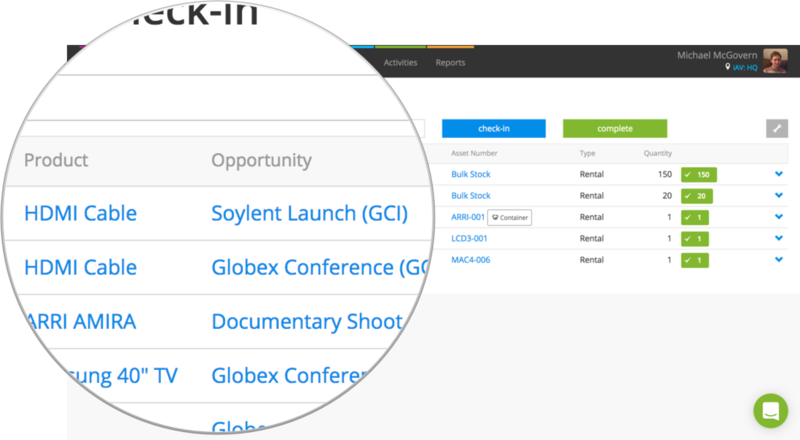 Instead of using the detail view for each opportunity or project to check-in your products, use the Global Check-in screen to check-in assets across all active opportunities in your store. Check-in assets across multiple opportunities. Edit a check-in to mark an asset or quantity as lost or damaged. Limit checking-in to items booked out to a particular organization or on a particular opportunity or project. View and take over other global check-in sessions. Head to Opportunities > Global Check-in to open the Global Check-in screen. Your initial view will be a blank global check-in screen. If you’ve started a global check-in, you’ll see what you’ve checked in so far. If you don't see the global check-in that you've been working on, you can use the View other sessions button as described below. Make sure your cursor is in the “Asset” field and simply scan an asset or barcode number to start checking-in. Set a quantity in the “Quantity” field, if you wish. As with the opportunity detail view, you don’t need a barcode scanner – type the name of your product or asset number into the “Asset” field and Current will auto-suggest kit for you. An item or asset will be checked-in if it’s booked out or part checked-in on an active order in the current store. When checking-in, Current will look across all active orders. This is especially handy for times where you might have cables out across multiple jobs – count the number and enter it into the “Quantity” field, then scan or type in the asset field and Current will check-in across opportunities. A line will be created for each opportunity. Serialized containers and their serialized components are checked-in as normal, but serialized components are not listed. When you check-in an asset on a global check-in, Current RMS prevents you from performing check-in actions for it on the opportunity detail view, although you may still perform quick check-in if there a quantity remaining that hasn’t been checked in. Complete a global check-in to perform actions on check-ins from the detail view. Current RMS will make a different noise when this box is displayed, so you know that it needs your attention. 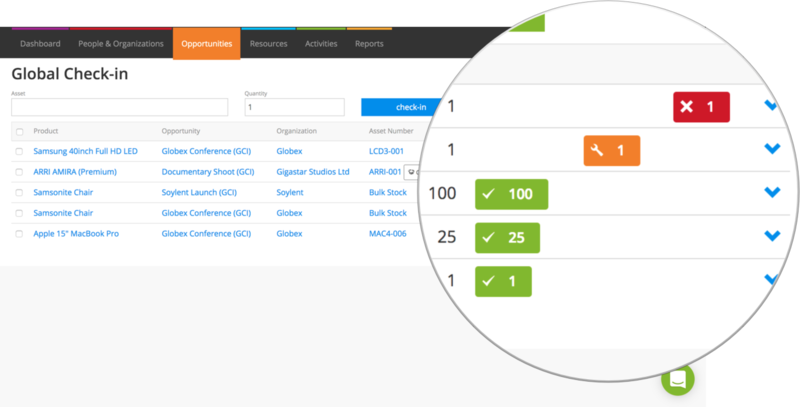 Tick boxes (for serialized stock) or enter quantities and hit the check-in button to check-in the selected assets. As with the detail view, edit a check-in to tell Current RMS that an item is lost or damaged. To edit check-in details, click the blue arrow to the right of a line and choose Edit from the menu. Use the small wrench icon at the top-right to adjust Global Check-in settings. Limit check-ins to items booked out for a particular organization. 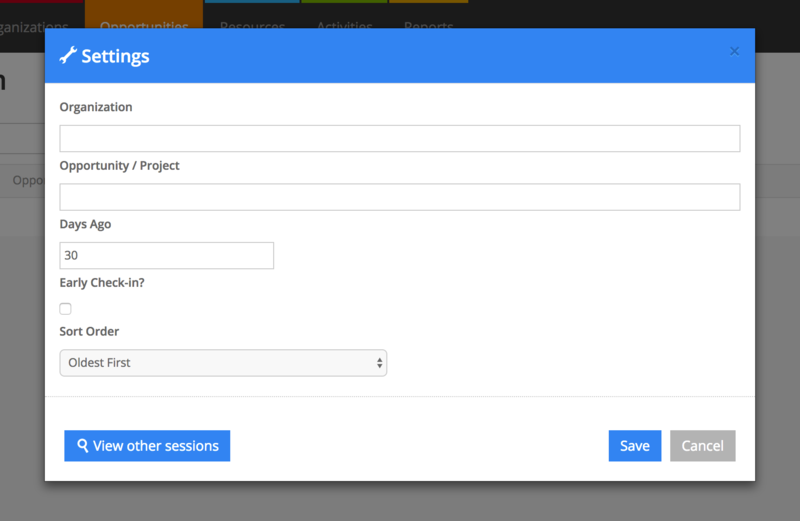 Limit check-ins to items booked out on a particular opportunity or project. How long ago should the opportunity have ended? For example, if today is August 15th and you set the number of days to 10, Current will check-in assets on opportunities with an end date of later than August 5th. Tick to check-in assets on opportunities where the end date hasn’t yet elapsed. 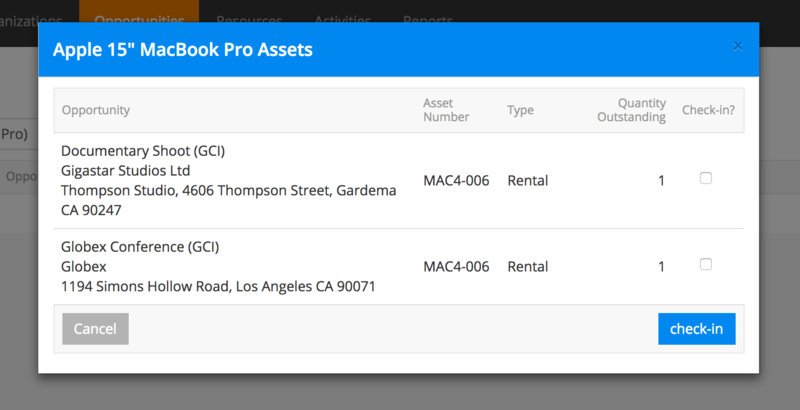 When checking-in assets, choose whether assets should be checked-in on oldest or newest opportunities first. Hover over the quantity column in the global check-in list to get an overview of what’s was booked out and what’s been checked-in so far. Quantities booked out and checked-in via the opportunity detail view. Quantities checked-in as OK, damaged, lost, sold, or returned using Global Check-in. The quantity remaining to be checked-in. If a check-in updates an existing row, the “Last check-in” figure lets you know the quantity that was last checked-in for that row. Reset check-ins for individual check-ins by clicking the blue arrow to the right of a check-in and choosing Reset from the menu. Click to confirm. Reset multiple check-ins at once by ticking the boxes to the left and then hitting the red Reset button at the top of the Global Check-in screen. When you’re done, complete the check-in to release the assets so you can finalize as normal from the opportunity detail view. Until a global check-in is completed you cannot change the check-in details of its assets or finalize its opportunities from the detail view. Complete by clicking the green Complete button at the top of the Global check-in screen. After you complete, your global check-in list will be cleared and any further alterations to check-ins will need to be done from the opportunity detail view.